When any person shares the message of the gospel of Jesus Christ to others, both the sharer and the receiver are greatly blessed. This category of posts is all about the blessings that come to those who participate in missionary work. 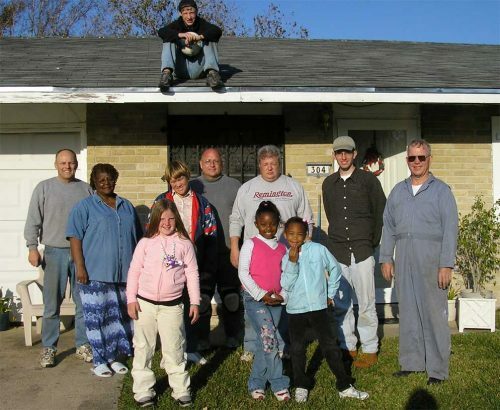 Eight years ago when I started this website, one of the first things I wrote about was how humility was one of the most important characteristics a missionary could posses. 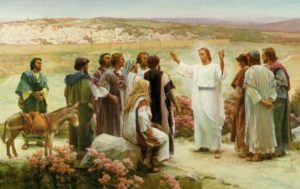 This weekend I was asked to give a talk in my ward sacrament meeting about humility, so I thought I’d share the text of my talk here. I hope you enjoy it and find it insightful and inspiring. In order for us to achieve our eternal salvation and happiness, there is a process that needs to be followed, a plan if you will. Because of our fallen state in this earth, each one of us would sin. We would need this experience to teach us and help us on our path of progression, but in the process, we would become soiled and unworthy to return to God’s presence. We would need a Savior who would atone for our sins, someone who would suffer for our mistakes and plea before God on our behalf to grant us re-entrance into the Kingdom of Heaven. Jesus Christ, the Beloved Son of God, Chosen from the beginning, humbly said “Here am I, send me” (Abraham 3:27) and volunteered to be our Savior and Redeemer. Satan didn’t like this plan. He sought to bring about the salvation of mankind without allowing us to go through the opposition and hardships of earth life (Moses 4:3). He didn’t seem to understand that there are no shortcuts to salvation. The path to salvation has been shown to us by Jesus Christ and that path includes the crucial step of humbly coming down to earth before eventually being raised to eternal life. We are all humbled during our mortal journey. Those experiences of humility begin from the moment we are born, helpless, and totally dependent upon our parents for survival. As little children we enter the humbling experience of school and begin to learn all the things we didn’t even know we didn’t know. As teenagers, we long for independence but are constantly reminded of our humility and our lack of understanding of the things of the world. Throughout life we have our ups and downs. Sickness, to one degree or another, affects all of us, keeping us humble and grateful for health. Loss of a job or trouble getting adequate employment is a humbling trial that many of us face. There are very few of us who haven’t experienced financial hardships that keep us humble and grateful for our material blessings. Then there is the humbling task of trying to raise children. As John Bytheway said, “before I had kids I had six theories on parenting. Now I have six kids and no theories on parenting.” Parenting is a deeply humbling experience for anyone who has had the blessing to try it. Yet, throughout life, we grow older, smarter, stronger, and wealthier and most of us slowly lose our humility. The evil one exerts his influence on us and then “When we are learned we think we are wise, and we hearken not unto the counsel of God, for we set it aside, supposing we know of ourselves” (2 Nephi 9:28). Pride, the opposite of humility, begins to creep into our hearts. The Book of Mormon prophet Moroni saw our day and testified against us: “And I know that ye do walk in the pride of your hearts; and there are none save a few only who do not lift themselves up in the pride of their hearts, unto the wearing of very fine apparel, unto envying, and strifes, and malice, and persecutions, and all manner of iniquities” (Mormon 8:36). 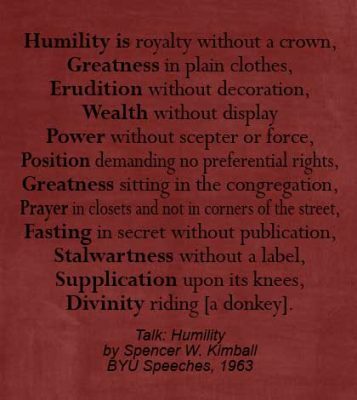 President Ezra Taft Benson, in his landmark talk called Beware of Pride, said that “Pride is the universal sin.” Elder Kim B Clark, in a 2009 talk, pointed out that “the perils of pride [occur] both in prosperity and in adversity.” Yet, I believe the converse is also true, that humility can be achieved in both prosperous circumstances and in adversity. The Book of Mormon prophet Alma confirms this: “there are some among you who would humble themselves, let them be in whatsoever circumstances they might” (Alma 32:25). Regardless of your circumstances, God wants you to be humble so that he can lift you up to eternal life (James 4:10).So while pride universally plagues us all, there are a righteous few who are able, by the grace of God, to overcome it. Yet for many of us, perhaps most of us, God compels us to be humble. And he does so for good and loving reasons. Quoting Alma again, “because ye are compelled to be humble blessed are ye; for a man sometimes, if he is compelled to be humble, seeketh repentance; and now surely, whosoever repenteth shall find mercy; and he that findeth mercy and endureth to the end the same shall be saved” (Alma 32:13). “Blessed are ye” for being humble. That got me thinking that I’d like to talk today about the blessing of humility. In preparing this talk, I did a quick count and came up with 33 distinct blessings from God that come by being humble. Today I will focus on only four of them, they are the blessings of Grace, Guidance, Growth, and Greatness. I pray that we may be humble and receive that divine blessing of grace. Alma said “But that ye would humble yourselves before the Lord, and call on his holy name, and watch and pray continually, that ye may not be tempted above that which ye can bear, and thus be led by the Holy Spirit, becoming humble, meek, submissive, patient, full of love and all long-suffering” (Alma 13:28). Certainly the scriptures make it abundantly clear that being humble is a necessary ingredient to receiving the guidance of the Holy Ghost in our lives. And the Holy Ghost will teach us all the things we need to do to return to our Heavenly home and live with God in celestial glory (2 Nephi 32:5). What do I need to do to be more happy? What do I need to do to strengthen my marriage? What does the Lord want me to change in my life? What do I need to do to become the person God wants me to become? I know that when I asked those questions, I got specific answers. The Lord prompted me with inspiration from His Spirit on how to change and improve and be a better follower of his son Jesus Christ. Guidance from God is a wonderful blessing of humility. The next blessing of humility is growth. As any of you who are weight lifters will know, in order to grow and increase your strength, you have to first break down your muscles. Muscles that are stressed beyond what they are accustomed to become damaged and that’s why your feel soreness after a workout. But your body, in a miraculous process, begins to repair those muscles and the new muscle grows back stronger and more capable. Similarly, to grow spiritually, we must come down in the depths of humility. We must be meek and lowly of heart, repent, and then we can begin to grow spiritually. Growth is a type of change, it’s progression, a good type of change. And another word for change in the scriptures is to repent. The Lord has called on all people everywhere to repent (D&C 18:9; 133:16; Moses 6:23, 57; 3 Nephi 11:32). Repentance has been the call of prophets and missionaries from the beginning to the present day. Church scholar Hugh Nibley once said that “the righteous are whoever are repenting, and the wicked [are] whoever are not repenting” (Scriptural Perspectives on How to Survive the Calamities of the Last Days, BYU Studies 25 (Winter 1985): 7-27). He then cited this parable from Luke chapter 18 where the Savior teaches that a humble, repentant attitude is necessary for spiritual growth and exaltation. 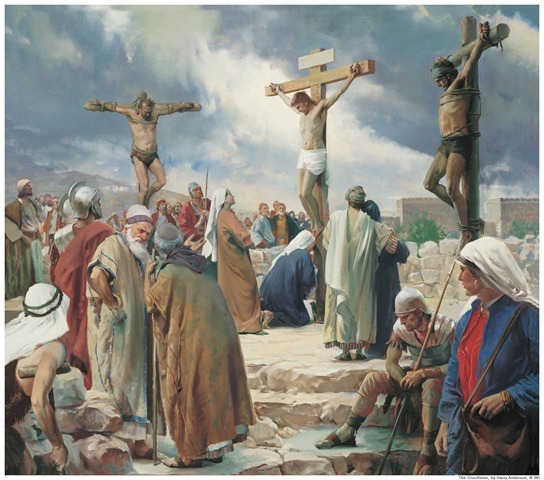 “Mercy claimeth the penitent, and mercy cometh because of the atonement; and the atonement bringeth to pass the resurrection of the dead; and the resurrection of the dead bringeth back men into the presence of God; and thus they are restored into his presence, to be judged according to their works, according to the law and justice. For behold, justice exerciseth all his demands, and also mercy claimeth all which is her own; and thus, none but the truly penitent are saved” (Alma 42: 23-24). Never stop improving. Never stop repenting. There is a large home improvement store with the motto: “Never stop improving.” It strikes me that in our spiritual lives, we should never stop improving either and we can accomplish that if we never stop repenting. The last blessing from humility that I wish to speak about today is greatness. 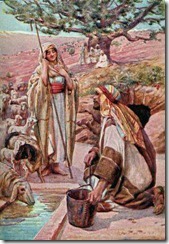 You’ll recall that when Jesus was on the earth, his disciples came to him one day and asked “who is the greatest in the kingdom of heaven?” (Matt 18:1) Jesus, then, “called a little child unto him, and set him in the midst of them” (v2) and said whosoever “shall humble himself as this little child, the same is greatest in the kingdom of heaven” (v4). To achieve greatness in the kingdom of heaven, one must be humble like a little child. Of course, to achieve greatness in this earth life, one must also be humble, though God’s definition of greatness is, of course, much difference than the world’s definition. The Savior taught by word and deed that “he that is greatest among you shall be your servant” (Matthew 23:11). 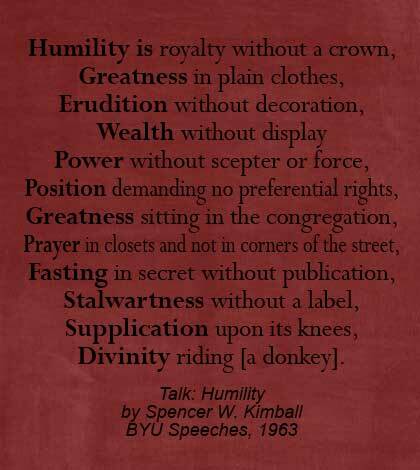 President Spencer W. Kimball, who’s talk on humility I referenced earlier, shared a wonderful poem about the humility, yet greatness of our Savior Jesus Christ and his faithful followers throughout the world. I was once sitting in the foyer of our church building and I noticed a man sitting across the way from me. I don’t know his name. I had never spoke with him. He looked tired and worn out by life. As I gazed on him, I felt like the Lord gave me a glimpse of his eternal identity. I felt reminded that he, his spirit or intelligence that is, has been alive for eons. He has had countless experiences and has gained much knowledge during that time. Unfortunately, the veil of forgetfulness we all pass through when we come to our humble mortal life, causes us to start over in many respects. But as I contemplated this, I felt humbled by what marvelous truths this man could teach me if he could pierce that veil of forgetfulness. I felt a little of what God sees as he views each of us, his children, with an eternal perspective. Truly, our eternal potential for greatness is infinite and that blessing is accessible through humbly following Jesus Christ. Greatness as heirs of the Heavenly glory and joint heirs with Christ. Developing and Polishing Character: Stephen L Richards, formerly of the Quorum of the Twelve Apostles, talked about the influence of missions upon the Latter-day Saints. “The fundamental character of our manhood and womanhood has been improved,” he said. 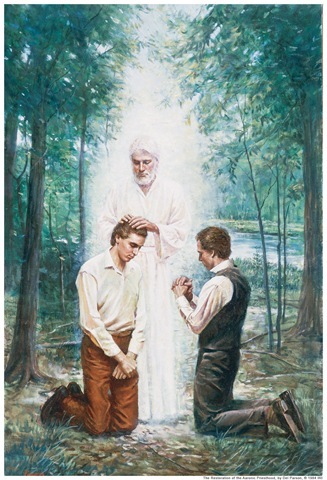 “I have given you seventeen blessings that result from missionary service. There are more—the list is almost endless. 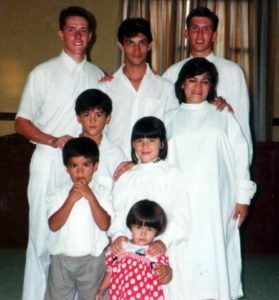 Please understand that these blessings and more can be yours, if you become converted to the service and make yourselves available to respond” (Carlos E. Asay , “The Blessings of Sharing the Gospel,” Prospective Missionary Conference in Provo, Utah, September 1984). President Spencer W. Kimball once said that “missionary work, like the tithing, will pour out blessings, as Malachi said, so many blessings that there’ll hardly be room enough to receive them (See Mal. 3:10. )” (Area Conference Report, Korea, Aug. 1975, p. 61). I know that missionary service requires sacrifice, but I also know that “sacrifice brings forth the blessings of heaven” (“Praise to the Man,” Hymns, no. 27). I add my testimony to Elder Asay’s and President Kimball’s that as you faithfully serve a full time mission, the blessings of the Lord will be poured out upon you. You and your family will receive blessings of both temporal and spiritual nature which will grant you joy in this life and in the eternities. This story, written by an anonymous author and cited in the book “Raising the Bar” by Ed J. Pinegar, is a favorite of many missionaries. I think it captures well the signs and feelings of a missionary who faithfully served the Lord and is returning with honor. As I jumped on board my flight from Miami to Salt Lake City, I paused for a moment to catch my breath. Seated near the front of the plane was an excited young man, probably 19, sitting with his parents. His hair was short, his clothes new and sharp. His suit was fitted perfectly; his black shoes still retained that store bought shine. His body was in good shape, his face and hands were clean. In his eyes, I could see a nervous look; his movements were that of an actor on opening night. He was obviously flying to Utah to become a missionary for the LDS church. 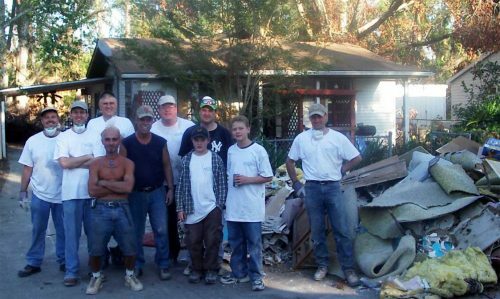 I smiled as I walked by, and took pride in belonging to the same church where these young men and women voluntarily serve the Savior for two years. With this special feeling, I continued back to where my seat was located. 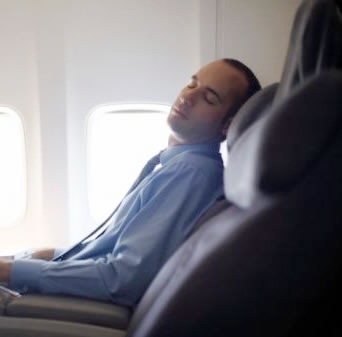 As I sat down in my seat, I looked to the right and to my surprise saw another missionary, sleeping in the window seat. His hair was also short, but that was the only similarity between the two. 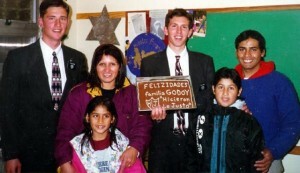 This one was obviously returning home, and I could tell at a glance what type of missionary he had been. The fact that he was already asleep told me a lot. His entire body seemed to let out a big sigh. It looked as if this was the first time in two years that he had even slept, and I wouldn’t be surprised if it was. As I looked at his face I could see the heavy bags under his eyes, the chapped lips, the scarred and sunburned face caused by the fierce Florida sun. His suit was tattered and worn. A few of the seams were coming apart, and I noticed that there were a couple of tears that had been hand sewn with a very sloppy stitch. I saw the nametag, crooked, scratched, and bearing the name of the church he represented, the engraving of which was almost all worn away. I saw the knee of his pants, worn, and white, the result of many hours of humble prayer. 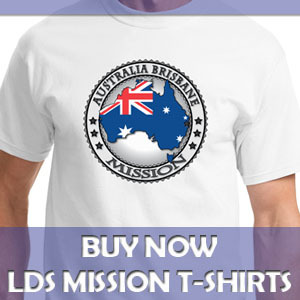 A tear came to my eye as I saw the things that really told me what kind of missionary he had been. I saw the marks that made this boy a man. His feet, the two that had carried him from house to house now lay there swollen and tired. They were covered by a pair of worn out shoes. Many of the large scrapes and gouges had been filled in by countless polishing. His books—laying across his lap—were his scriptures-the word of God. Once new these books which testify of Jesus Christ and his mission were now torn, bent, and ragged from use. His hands, those big, strong hands which had been used to bless and teach, were now scarred and cut from knocking on doors. Those were indeed the marks of a man. And, as I looked at him, I saw the marks of another man, the Savior, as he was hanging on the cross for the sins of the world. His feet, those that had once carried him throughout the land during his ministry, were now nailed to the cross. His side, now pierced with a spear, sealing his testimony with his life. His hands, the hands that had been used to ordain his servants and to bless the sick were also scarred with the nails that were pounded to hang him on the cross. Those were the marks of a great man. As my mind returned to the missionary, my whole body seemed to swell with pride and joy because I knew, by looking at him, that he had served his Master well. My joy was so great that I felt like running to the front of the plane, grabbing the new missionary, and bringing him back to see what he could become, what he could do. But, would he see the things I saw? Could anyone? Or, would he see just the outward appearance of that mighty elder, tired and worn out, almost dead? As we landed, I reached over and tapped the returning missionary to wake him up. As he awoke, it seemed like new life poured into his body. His whole frame seemed to fill as he stood up, tall and proud. As he turned his face toward mine, I saw a light that I had never seen before. I looked into his eyes. Those eyes. I will never forget those eyes. They were the eyes of a prophet, a leader, a follower, a servant. They were the eyes of the Savior. No words were spoken. No words were needed. As we unloaded, I stepped aside to let him go first. I watched as he walked, slow but steady, tired but strong. I followed him, and found myself walking the way he did. When I came through the doors, I saw the returning missionary in the arms of his parents, and I couldn’t hold it any longer. With tears streaming down my face, I watched these loving parents greet their son, who had been away for such a long time, and I wondered if our parents in heaven would greet us in the same manner. Will they wrap their arms around us and welcome us home from our journey on earth? I believe they will. I just hope that I will be worthy enough to receive such praise, as I’m sure this missionary will. I said a silent prayer, thanking the Lord for missionaries like this young man. I don’t think I will ever forget the joy and happiness he brought to me that day. Last year, when I wrote about Mission Companions, I mentioned that learning to get along with your mission companion is excellent practice for learning to get along with your eternal companion, your wife. 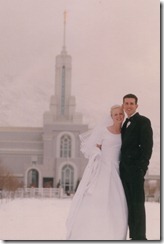 Today I’d like to elaborate more on how a mission prepares you for temple marriage. Those who are sealed in the temple have the assurance that their marriage will continue forever if they obey their covenants. They know that nothing, not even death, can permanently separate them. Heber J. Grant, 7th president of the Church, emphasized the importance of every young man and woman starting their life together with a temple marriage. 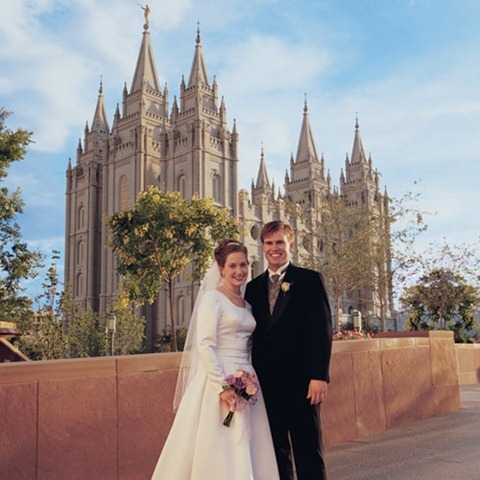 I believe that no worthy young Latter-day Saint man or woman should spare any reasonable effort to come to a house of the Lord to begin life together. 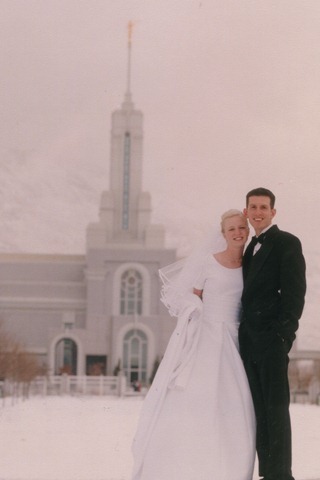 …The blessings and promises that come from beginning life together, for time and eternity, in a temple of the Lord, cannot be obtained in any other way and worthy young Latter-day Saint men and women who so begin life together find that their eternal partnership under the everlasting covenant becomes the foundation upon which are built peace, happiness, virtue, love, and all of the other eternal verities of life, here and hereafter (Heber J. Grant, “Beginning Life Together,”Improvement Era, Apr. 1936, pp. 198–99). The story of Jacob marrying Rachel has always seemed to me as a good example of the making every possible effort for a temple marriage. When Jacob was ready to get married, his father, Isaac, instructed him not to marry any of the daughters of Canaan because they were not of their faith. 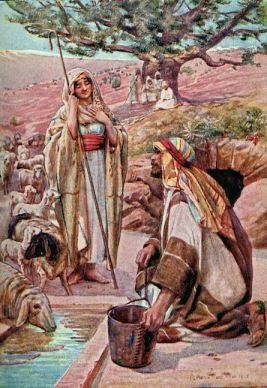 Rather, Isaac instructed Jacob to go to his uncle Laban’s home and seek a wife there, among people of their same faith (see Genesis 27 & 28). 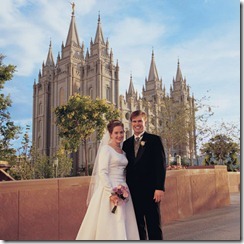 I know that my faithful missionary service helped prepare me for a temple marriage. 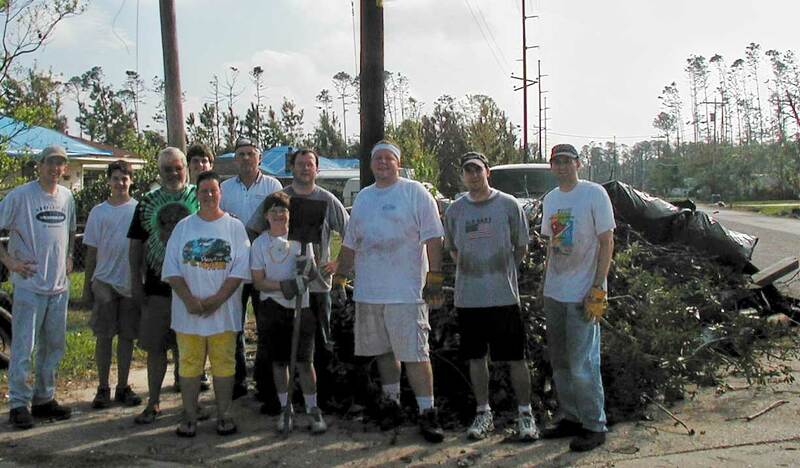 It helped me learn to get along with others, to work together for common goals, and it helped me grow spiritually and provide a sound foundation for a Christ-centered life along with my wife. I love my wife with all my heart, and I am eternally grateful that we started off our marriage the right way, being sealed by priesthood authority with a temple marriage. I know that as you strive to do your duty as a missionary, the Lord will bless you with a stronger marriage, and a happier life on earth and in heaven. The following is a great little video with Elder Packer and Elder Holland, of the Quorum of the Twelve Apostles, talking about the blessing of a temple marriage. One of the blessings of missionary work is that it cleanses sin. Of course only our Lord and Savior Jesus Christ has the power to cleanse us of sin, but what I mean when I say that missionary work cleanses sin is that by faithfully doing missionary work, we naturally do the things that are necessary to put the atonement to work in our lives. When I arrived in Argentina and had my first interview with my mission president, he shared this scriptural concept and it has always stuck with me. I wish I had written down the scripture he shared with me that day, but perhaps it’s better that I can’t remember what it was because it has caused my to do my own scripture study of the subject. Which, if any, of these scriptures was the one my mission president shared with me all those years ago, I do not know. But it seems to me, through studying these scriptures, that sincere, true missionary efforts naturally leads to forgiveness of sins. By being a worthy missionary and helping others come unto Christ, we ourselves are brought closer and receive His cleansing power. 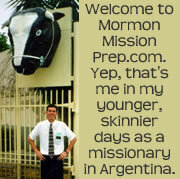 It’s not the doing missionary work gives you a free pass from your sins. It’s that to do true missionary work requires the individual to go through the God-given steps of faith, repentance, and cleansing Priesthood ordinances of salvation which make us worthy and able to return to live with God. 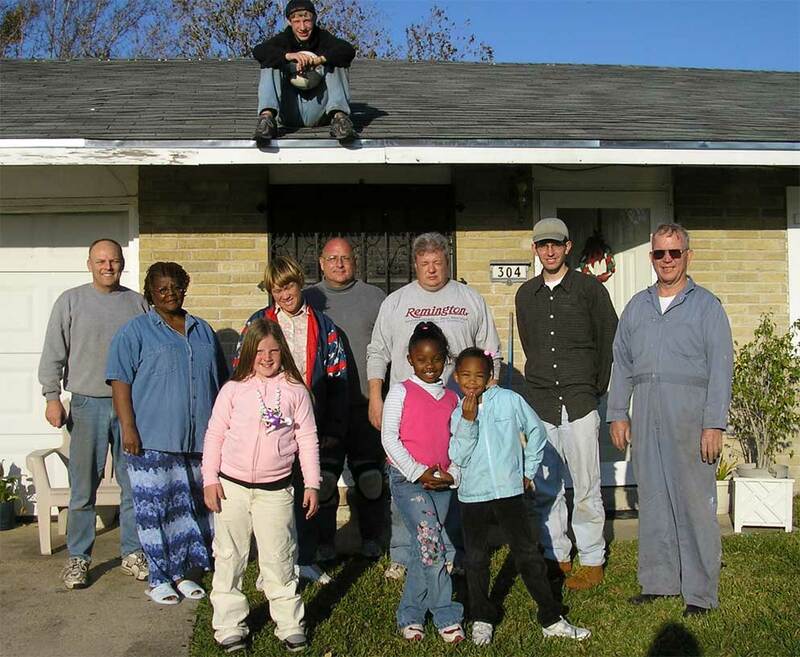 The main purpose of missionary work is to help bring others to Christ, but and importance secondary purpose is that it brings the missionaries themselves closer to Christ. 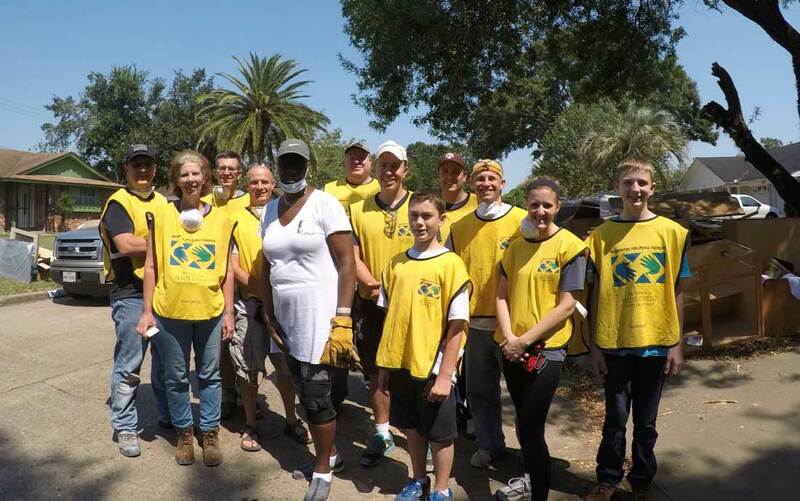 I thank Heavenly Father for this wonderful blessing of missionary work with its dual effect of gathering those into the restored gospel who previously did not know of it, and its ability to cleanse and purify the missionary workers themselves.